Indonesia is "convinced" one of Asia's most wanted men - a bomb expert thought to have been behind the 2002 Bali attacks - has died, says the president. Malaysian Azahari Husin and two other militants are believed to have blown themselves up after police surrounded their house in Malang, East Java. One officer reportedly identified Azahari after finding his remains at the site, but DNA tests will be taken. 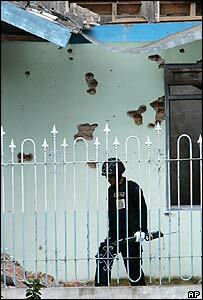 Australia, which lost many citizens in the Bali bombings, welcomed the news. Known as "Demolition Man" in his native Malaysia, he is suspected of masterminding other attacks. And, along with fellow Malaysian, Noordin Mohammad Top, he is said to be a key member of the militant group Jemaah Islamiah (JI). 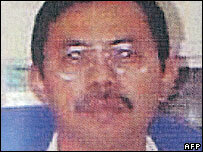 A BBC correspondent in Jakarta, Tim Johnston, says Azahari was known to be a master of disguise. If his death is confirmed, it is likely to deal a major blow to the JI's network, our correspondent says. "We are convinced it is Azahari," President Susilo Bambang Yudhoyono said. "But we need to carry out laboratory tests." Australia's Federal Police Commissioner Mick Keelty said Azahari's head had remained in tact after the blasts and was recognised by an officer who had been hunting him for years. "If he is confirmed as being the person who died in this operation yesterday... it will make a big dent in the operations of the radical terrorists groups in Indonesia," he told Australian radio. "The last one, the big one, was a suicide blast, that is the one that killed them," Gen Sutanto told reporters at the scene. He said the house was being swept for booby-traps before forensics officers could go in and retrieve the corpses for DNA tests.